Let’s follow this unlikely scenario. You are driving down Sunset Cliffs, heading South from Newport Avenue, and you pass a Thai restaurant, a couple of Italian restaurants, an Indian restaurant, a defunct Mexican restaurant, a donut shop, a coffee shop and a market. 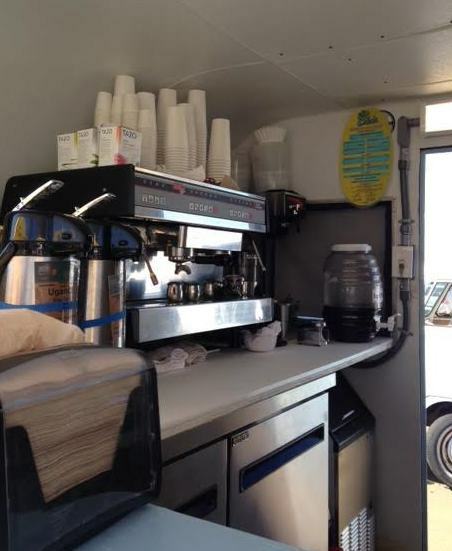 And as you continue your drive all of the places to eat, or have a cup of coffee, vanish. You are quickly approaching one of the most scenic areas of San Diego, when, out of the blue, on a piece of cement no bigger than 40 feet wide, you are met with a blue and white trailer sporting a yellow surf-board on the top, and, in a wide array of colors, a “menu” featuring coffee, acai, smoothies and hot dogs. This is just down the street from the Little Lion and at the south end of the parking lot where the new mechanic plies his trade. What is this trailer? you ask. Funny that you should ask that question, because I asked it also. I watched it being set up, wondering just what would develop and today the suspense was just too much so Hitomi and I sauntered over to find out what was going on. 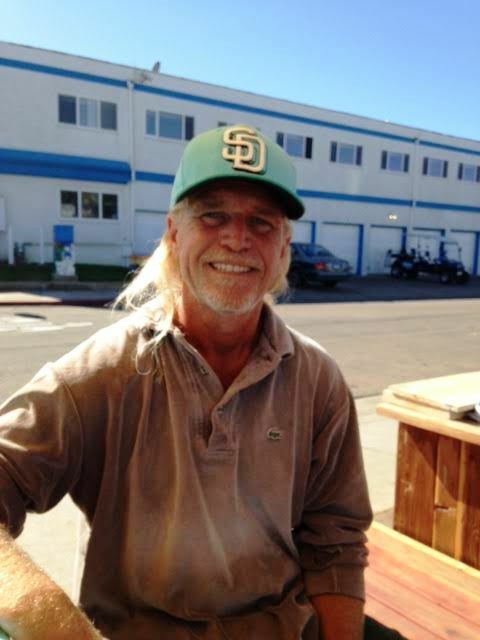 The Surf Check is owned by someone that has been in San Diego – more importantly Sunset Cliffs – for years. His name is Richard Aguirre; he is the president of “Save Sunset Cliffs” and a dedicated, concerned person – concerned about so many things. We began talking about the erosion that is going on at the cliffs; his research shows that the main problems are caused by the storm drains. In fact, he is just about completed with a 3 minute movie depicting the problems of the erosion of the area. He talked about the city’s plan to put in parking meters, a camp ground, etc. without any community input. He feels that in the next few years the erosion at the Cliffs will reach gigantic proportions and we are in danger of losing this valuable resource. He is afraid that not only will there be home loss, but life loss as well. 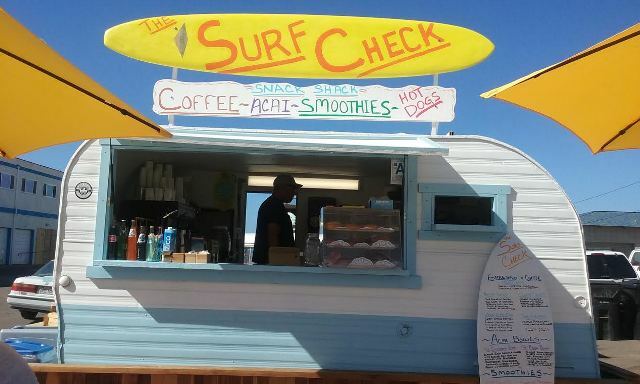 Now since this “review” is really not about Richard’s philosophy but about his snack bar, I hope that your appetite has been whetted enough to read his “Save Sunset Cliffs Master Plan” on the internet. If nothing else it is an enlightening read. So what about the Surf Check? Hitomi and I each decided to try a drink – she had a “Wave of the Day” – a latte with a choice of caramel, vanilla or mocha; two shots of expresso; steamed almond milk topped with whipped cream. It came in a 16 oz or 20 oz cup and was either $4 or $5 depending on the size. I had a Strawberry Smoothie ($5) which had, but not limited to strawberries, banana, mango, and pineapple. Both of our drinks were very tasty. As we were standing at the counter waiting for our order, we both decided to have a hot dog, and Richard gave us the options of mustard, relish, ketchup, sauerkraut, etc. We opted for everything. 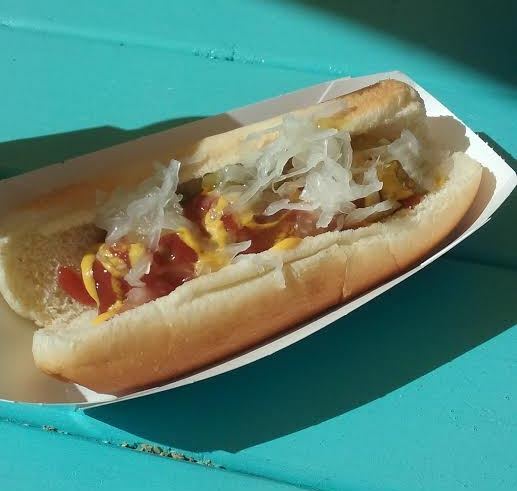 The bun was hot and fresh, the hot dog was good, and we both enjoyed it. We sat at one of the small wooden tables under an umbrella, that was on a small, nice, redwood platform. The two hotdogs totaled $5. 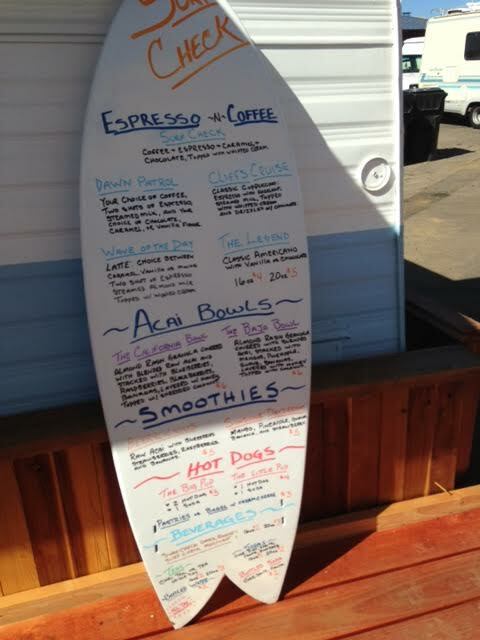 Also on the menu is Expresso and coffee (featuring Bird Rock Coffee), Acai Bowls, and other beverages. I noticed that he had some Fanta on the counter and I remarked how it brought back memories of some of our camping trips to Mexico. He told me that in the next few days he will have a cooler at the side of the shack (trailer?) that will feature all of the Fanta beverages. What fun that will be. He also said that they are going to have a drinking bowl for the dogs that come by, because this area has many dog walkers. Richard said that he has been thinking about this place for months. He said that when those of us walking and living near this part of Ocean Beach/Pt. Loma want to get a cup of coffee we had to go into downtown OB to do so. Finally there is something for those of us walking our dogs; enjoying the scenery; riding our bikes, or just looking at nature’s beauty. There is a “drive through” if you don’t want to get out of your car. It took him almost six months to get all the necessary permits but he has them now.